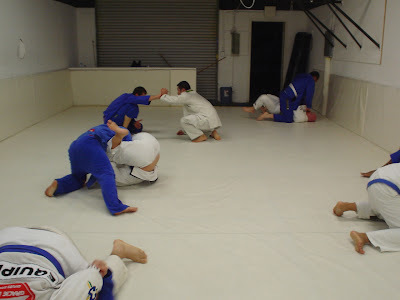 Well, its Thursday night and once again, it was time to step out of our comfort zone and check out another BJJ school in the area (soon enough we will have to travel outside of LA/Orange County). Tonight, we decided to check on what Tinguinha is doing at his new location in Anaheim, California. With a long list of schools to see and experience, we opted for Tinguinha's out of both convenience (it's fairly close) and his teaching skills as observed from his well received DVD series. My first exposure to Tinguinha was after seeing his Spider and Cross Grip DVDs, both of which became some of my favorite guard specific DVDs. Being one of the original Gracie Barra guys, I also thought that his teaching style and skills would be both familiar and easy to adjust to. I was both right and wrong - but in a pleasant way. 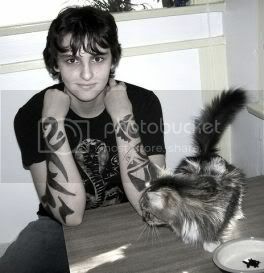 His teaching style was very familiar, but very intense and the school was very welcoming and friendly. I love it when students introduce themselves and are smiling. Jiu-jitsu is supposed to be fun, so why shouldn't we be smiling! The warmup felt really brutal for Haley and I (we had ran earlier in the day), but Jake and the rest of Tinguinha's students really breezed through it. I liked how it was core intensive - a lot of crunches, triangles, and jogging. The shrimps to bearcrawls gave me a workout that I hadn't experienced since my last judo class at OCK. Next up, Tinguinha went through three throws off of the Russian Grip or Cross Grip and Back Control. The opponent took the posture of crossing his arm to your shoulder and trying to stay square. Tinguinha showed a single on the near leg, the sumi gaeshi when they pull that leg out to posture back, and the uchimata - a Carlos Gracie Jr. favorite. I was partnered with Haley and we did ten reps each and then moved to the next throw. I felt so gassed! I was breathing hard, but still having fun. Next up came the sparring. Without going too far into the nuts and bolts of each sparring round, let's just say I got pretty rolled up by a couple of the guys. Everyone impressed me, but Grant has a special tenacity that you just cannot teach. 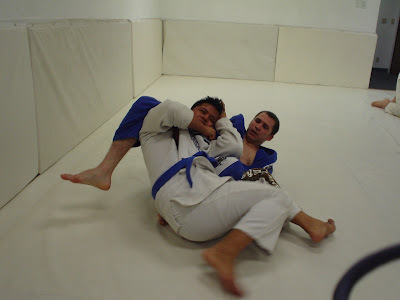 It is always a great experience to get dominated at your own belt; it just lets you see how far people can take BJJ. Grant was a monster with his gi chokes too!! I really wish all the guys the best in their coming PanAms performances. Unfortunately, Tinguinha was out of commission with a bum knee, but he was very observant and helpful during all of my sparring sessions. I got to see Haley and Jake spar a bit and I was really impressed and happy to see both of them stepping outside of their element. So far, community jiu-jitsu has been a wonderful experience- I have met some great students, great instructors, made some friends, and faced the unknown of sparring at another school! It is like a lower stress version of tournament competition. Here's a picture of Jake in action and a nice class shot with Haley hunting for the armbar! Regarding my journey of broadening horizons and experiencing the BJJ community at large, everything has surpassed my expectations. I see an emerging theme, BJJ is more connected than many people may imagine or would like to acknowledge. I have been met with great students and instructors everywhere we have visited and have not found the attitude that many feel is indicative of BJJ training. My sparring sessions have been great and I am able to take a fresh perspective back to my home academy and training. Not to be too redundant, but the experience has been a real gift. For those future community bjjers out there, I advise everyone to talk with their instructors, get a crew together, and get out there and live up the differences that all these BJJ athletes have to offer. Next community jiu-jitsu trip? I'm thinking of Tim Cartmell. The guy is like a BJJ zen master. Can you say, "Bagua Mount"? Nice jiu jitsu site man, I'm bookmarking you. Very detailed descriptions- IMO, it is important for all martial artists to be exposed to different people with different training methods. Everyone has a their own unique mentality and physiology. It's not like you can always copy one style and reach your highest potential. You can only take what you understand and make it work for you own game. This is an awesome blog,...well done Kevin. Very detailed descriptions- IMO, it is important for every martial artist to be exposed to different people in different training environments. Everyone has a their own unique mentality and physiology. It's not like you can always copy one style and reach your full potential. You can only take what you understand and make it work for you own game. This is an awesome blog,...well done Kevin. Thanks Glen and Nikki! Glen, we've been having some good times at Mike's too - you should get in on it. Hopefully Mike's wrestling coach friend, Victor, can start showing us some cool stuff too. 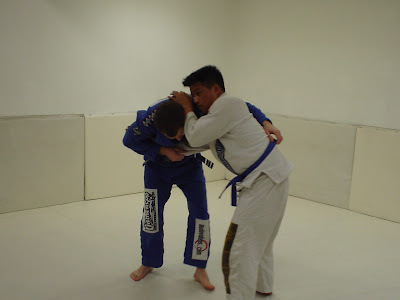 "Like" The Jiu-Jitsu League (Kevin's academy) for more training info! Currently I'm a brown belt in BJJ and a brown belt in Judo and I train with ATOS JJ. I have an MA in International Relations and Political Theory from CSULB and am currently working as a Political Science professor at the community college level. In addition, I write the Budo Blog at www.budovideos.com, have written as a contributing author to Gong and Fight Life, and am an author for Victory Belt Publishing. My future plans include a PhD in Political Science and absorbing new perspectives. 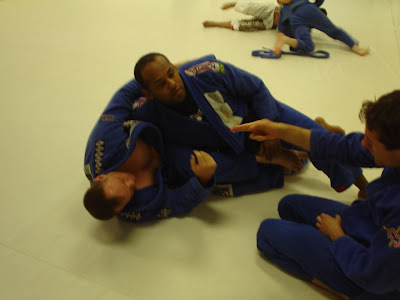 I am also the head instructor at ATOS JJ's academy in Long Beach, CA, THE JIU-JITSU LEAGUE.